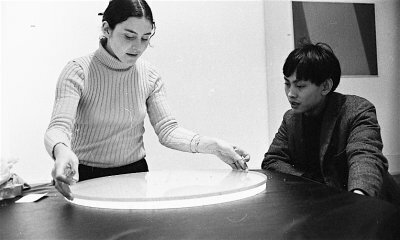 Below: Liliane Lijn and David Medalla at Signals in 1964. Photograph © Clay Perry. Signals gallery – which grew directly out of ‘The Centre for Advanced Creative Study’ set up in London in 1964 – was ‘dedicated to the adventures of the modern spirit’. 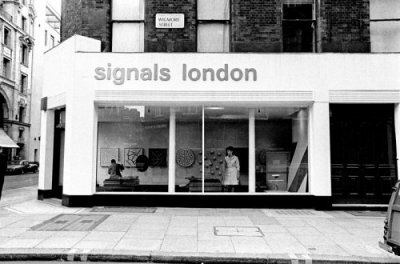 With its exhibitions and events, the opening of a gallery in London’s West End, together with the publication of the influential Signals Newsbulletin, Signals became a centre for experimental international artists, with links formed between the avant gardes of Latin America, Europe and London. England & Co is holding a small survey exhibition devoted to Signals – a key London outpost for many of the Latin American artists of the 1960s avantgarde – opening to coincide with the forthcoming exhibition starting in July at the Royal Academy in the Sackler Wing Galleries, Radical Geometry: Modern Art of South America from the Patricia Phelps de Cisneros Collection.